Author: Henning Schreiber. Series edited by: Raimund Kastenholz. 16 pp. Roman, 331 pp. Linguistic research into the Mande languages until now focussed on the Western branch of the family, the Eastern varieties, however, have been comparably neglected. While in recent times documentation of the Eastern Mande languages has improved, research into the language history is still very much at its beginnings. 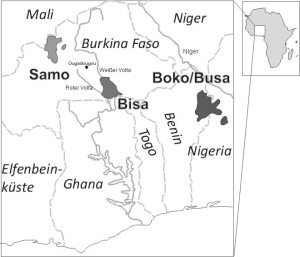 By providing a reconstruction of Proto-Niger-Volta (PNV), this work aims to contribute to the ongoing research into the history of Eastern Mande. It may serve as a basis for further studies of the linguistic history of Mande in general as well as historical processes in the entire region of the Volta basin. The reconstruction of the phonological system of PNV encompasses the consonant and vowel system, the workings of nasalization and the syllable structure. On the basis of recurrent phonetic analogies and the reconstruction of a proto-morphology, a corpus of some lexical proto-forms is also presented. The appendix lists these lexical reconstructions as well as a glossary of German–PNV, PNV–German. 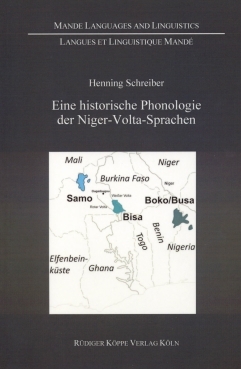 The book is an indispensable contribution to the historical linguistics of West Africa and the Niger-Congo languages.